Rating: 5 stars. No question. Do you like Shakespeare? What about Star Wars? Would you ever think to combine the two? Ian Doescher did, and he is a genius. What a brilliant production this was! If you have any inclination to listen to an audiobook at all, this should be next on your list. We start with Verily, a New Hope. Of course, most of us already know the story of young Luke Skywalker, strong with the force but naive, thrust into a rebellion he had not initially intended on joining. Doescher has thought out every detail in how to translate George Lucas's creation into Shakespearean drama and language, not to mention form. Blank verse, prose, iambic pentameter; all are in here, and all work exceedingly well. Nice afterwords describe why Doescher chose to write certain things in certain ways. As for the actual production? Absolutely fantastic. We have a full cast, complete with actors I assume were chosen because they sound so much like the movie actors (I mean, Han Solo might as well as been voiced by Harrison Ford; it's so good. With the exception that he can't seem to pronounce Millenium Falcon?). In addition, there are sound effects, MUSIC FROM THE MOVIES, alien languages, AND some of the characters get their own SONGS. That they actually SING. It's amazing. If you haven't experienced the beauty of this audiobook trilogy, get thee to a library and partake! I promise you won't regret it. Disclosure: After a long awaited release for an audio CD, I was finally able to check these out from my local library. These books look really good. I love the idea of Star Wars in a Shakespeare theme. Great review! 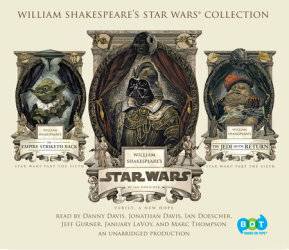 love the idea of Star Wars in a Shakespeare theme. Great review! I was aware these books existed, but never thought about them on audio--and with my commute, I'm ALWAYS looking for good audio recommendations. Will definitely be checking to see if my library has these. Thanks for the tip! I've been meaning to read this one but I hadn't considered listening to the audiobook. Thank for the great idea! YES. The audiobooks were so brilliant. I'm sure I would have loved these on their own, but with the cast and the sound effects and the music? Perfection. I've been meaning to read this one but I hadn't considered listening to the audiobook.